A look at the Shanique Myrie case and how class and taste impinge on it. There’s a landmark case being heard in Kingston, Jamaica, at the first sitting of the Caribbean Court of Justice (CCJ ) here. 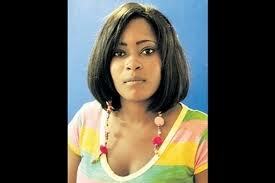 In March 2011, Jamaican Shanique Myrie landed in Barbados to visit a friend there (by her own account). Instead of the usual sedate Barbadian welcome Myrie was treated to a cavity search, kept in a dark room and deported the next morning to Jamaica although nothing illegal was found on her person or in her possession. After this unceremonious return to the country of her birth Myrie charged that in the process of the cavity search she had been finger-raped by the immigration officials concerned. Her lawyers took the case to court claiming that her rights as a CARICOM citizen were abused, and that she was discriminated against because she is Jamaican. The CCJ argued that Myrie does indeed have a case against Barbados and the trial began yesterday morning at the Jamaica Conference Centre in downtown Kingston. A beautiful fair skinned pony tailed, black suit, white inside blouse wearing young woman in a medium heeled closed up black shoes, Shanique Myrie is called into conference room 2 at the Jamaica Conference Centre, in a fight for her rights as guaranteed under the Revised Treaty of Chaguaramas which establishes the Caribbean Court of Justice, CCJ. In the first place, the Grammar Nazi in me was offended by the overladen, clumsy, grammatically dubious lead-in to the report. How on earth could “white inside blouse wearing young woman” be considered acceptable English by anyone but particularly a journalist? Was there a moratorium on fullstops, commas and hyphens? How could a black suit ever be described as beautiful, fair-skinned and pony-tailed?! Wearing a diamond shaped gold looking clip on earring, Miss Myrie recites her full name as Shanique Samantha Myrie who though unemployed now works in food and beverage in better times. I was dumbfounded and took to Twitter challenging this gendered depiction of events. Why not focus on the substance of what was unfolding in court and leave sartorial detail to be captured by TV cameras ? The journalist responded saying “I believe it is important to paint a full pic for all.” She appeared puzzled by my objections. Curiouser and curiouser. Pray how did it help to know that the claimant wore a medium heel shoe I tweeted back. This landmark case is not only about nationality, it’s also about ‘class’, the ungainly elephant in the room no one wants to explicitly mention. It is important to portray Myrie as ‘decent’ ‘respectable’ and ‘sober’ because the image of Jamaicans in the region is overwhelmingly influenced by the higglers, DJs and hustlers who often represent the face of Jamaica, visiting, even migrating to other countries, where they are not always welcome. Why? because these enterprising but capitally-challenged individuals (ie owning little capital, whether financial or social) often violate all the dearly held norms of ‘decency’ ‘respectability’ and ‘good taste’ with their choice of garments, raw speech and boisterous behaviour. They regularly transgress the zealously guarded borders of civility and decorum as much as the borders of nation states which under the new Chaguaramas Treaty they now have a right to breach. Perhaps this was why Myrie was given the finger when she arrived in prim and proper Barbados, regionally glossed as ‘Little England’. Not just because she was Jamaican but because she was perceived to be a particular kind of Jamaican. So @Emilynationwide was right to emphasize the outfit and demeanour of Ms Myrie. It may be extremely germane in the instant case. PS: The overall point I’m making in this post is not to dis the journalist concerned or claim that there was no substance to her post. Far from it. When i said let’s focus on substance rather than style or appearance it hadn’t yet occurred to me that in this case style IS the substance or a substantial part of what’s at stake. I realized belatedly based on something @diva_simmo said that the reason for the focus on Myrie’s dress was because class prejudice is a real danger here and Myrie’s appearance is material evidence that may well influence the jurists involved, so much so that her legal counsel went to great pains to counter this by dressing her ‘classily’. So Emily was right to focus on how this was achieved. Being somewhat resistant if not immune to the strictures of fashion this wasn’t obvious or self-evident to me. My point is simply that if class is an issue let’s explicitly state it and discuss it because that’s the substance of what we’re getting at by extensively describing Myrie’s carefully assembled clothing. Profound apologies for any distress I caused Emily Crooks. This one truly grieved me. I saw it earlier today and my heart just sank. In a Barbadian blog, I also saw a photo of Ms. Myrie that seemed to have been deliberately sharpened and colorized to make her appear fiercer than she actually looks. This is a heavy burden Shanique is bearing for all of us and I hope she manages to get more justice than she can afford. Hopefully the 6 men on the CCJ are more compassionate to women than we women are or that the one woman has enough clout to sober them all up. As Cayman islander, I support Barbados. please bajans continue to fight these people. She is wrong . We’ve also had problems with these people.They’re destructive people with criminal mentality. If the Caribbean had more people like bajans we would be A tremendous region. Jamaicans along with Guyanese are holding us back. Bajans are trying they best to put A stop to the childish incompetent Jamaicans**compare both islands . It’s always good to know what those who oppose us think, For that i thank you Nick…. You asked the right questions and got the necessary answers. I too watch the proceedings and outcome of this case with great interest, as a Jamaican Woman. Her attire should not be the focus of the case or even be considered as pertinent information about the victim. What is this? Joan Rivers’ Fashion Police? Was she expected to wear something else? Based on my knowledge of a hearing; it is a formal occasion. Annie, thanks for the post. I enjoyed reading it. Thanks for leaving a comment Nicoy! hope you’ll visit again! Annie, I appreciate your analysis. I still believe Emily’s laborious detailing of her dress was irrelevant and sexist. Even if it illustrates the class dimensions of this case, the re-interrogation of this woman’s ‘respectability’ is unnecessary. Regardless of her social strata or what she wears, the facts of the case should speak for themselves. I cannot deny that jurists, like the rest of us, suffer from implicit bias, but that’s not an excuse to affirm sexist, classist discourse that renders some women inferior and ostensibly more deserving of harassment or sexual assault. Afternoon, Annie. The relevance of the (rather poor, but, let us take the will for the deed) description would be clearer to me, had I been given an idea of SM’s dress/look when she arrived in B’dos. Did she have a “certain look” then? Were her peeps/advisors trying to counter that “look” by ensuring that she dress a certain way for the Court appearance? I get that you have deduced a possible class thing and, in a bit of acquiescing to EC, given her some distinction – albeit for an “[inadvertent] gesture at the real problem”. Really sounds to me like she was reaching for a novel-like narrative and buck up on the so-called class thing. Perhaps I missed it, but, she hasn’t yet said/tweeted to agree with you that that is what she was going for. I don’t buy the class element. As I said to my sis (who brought the blog exchange to my attention), a question remains. Even if Jamaican DJs and higglers dress a certain way, does the average Jamaican visitor to B’dos follow suit? (Unintended pun.) Again, dress description would become relevant for me only if the detail of her attire on her arrival in B’dos were also brought into the picture – giving an idea of how she might have been perceived then. Further, image does matter, I guess. But, (another commenter did make this point), does it matter so much to the case – and to the members of the panel – that the merit of the evidence will end up playing second fiddle to image? What does this really say about the perception of the competence of the panel? you raise a number of pertinent and valid questions. 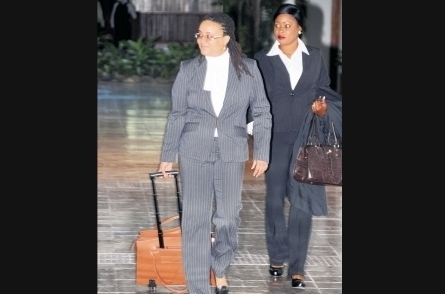 i never really took interest in this case till today so couldn’t say how Myrie was dressed on arrival in Bdos. Appearance is one thing, how one sounds is another, class is also often tied to one’s accent. I was struck by Shanique’s voice which i heard on a newscast. definitely not a voice schooled in an uptown institution but though she sounds tentative and soft-spoken she’s quite tenacious about standing her ground and doesn’t hesitate to refute or disagree with suggestions put forward by mellifluous sounding lawyers in court. I was quite impressed by that. I think there’s a not unjustified assumption that Barbadians and possibly other Caribbean citizens who constitute the jury might have the usual prejudiced view of Jamaicans and yes it would see that the legal team is doing everything to counter that. and no, Emily hasn’t said she agrees with me but @diva_simmo who defended Em quite vigorously is the one who suggested by something she tweeted that class issues might underlie some of all this. she also explicity stated it in a separate tweet. i agree i was trying to portray all this in the best light possible as i do have a high opinion of the journalist concerned. Thanks for your reply, Annie. Good on SM to stand her ground in spite of. I understand your efforts to portray it all in the best light. Well, let’s see how it all comes together – or falls apart (depending, then, on whom you ask). Hello again Annie. Haven’t been on the blog in quite a while. – there is no jury. It is a panel of judges. The judges of the CCJ are the Right Honourable Sir Dennis Byron (president of the court and a national of St. Kitts and Nevis), the Honourable Rolston Nelson (a national of Trinidad and Tobago), the Honourable . W. Charles Anderson (a national of Jamaica), the Honourable Adrian Saunders (a national of St. Vincent and the Grenadines), the Honourable Désirée Bernard (a national of Guyana and a woman by the way), the Honourable David Hayton	(a national of the United Kingdom) and the Honourable Jacob Wit (a national of the Netherlands with experience in the judicial system of the Netherlands Antilles before that country was dissolved). I’m a bit disappointed though that Karee in the first comment would take the sexist approach in presuming that the one woman on the CCJ panel would have “enough clout to sober up” all the men on the CCJ panel and presumably provide “justice” to Ms. Myrie. This is actually quite sexist as it presumes that the woman on the panel will be sympathetic to Ms. Myrie and the 6 men there are unlikely to be sympathetic. It also presumes that Ms. Myrie must be right for some reason and that reason seems to be that it is because she is a woman. The thing though is that this is about law, not sympathy. And in case we forget, one of the accused is also a woman. Should she not expect sympathy as well being a woman? Or is it more important that her name and the name of her co-accused are actually cleared if it turns out that they were innocent? Here is the the basic problem – one person (note I’m not using gender here) has accused two other persons of discrimination and assault. The two accused have denied this. Obviously both parties cannot be telling the truth. Somebody is lying (indeed they both may be lying to some degree). What is important is the truth. 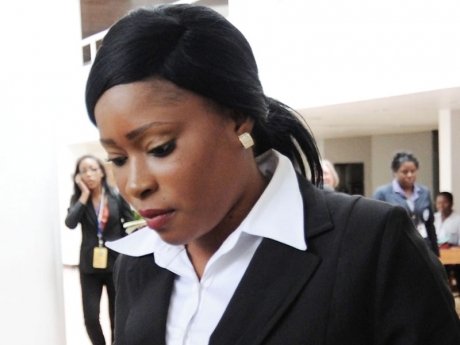 – Ms Myrie claims that she went to Barbados to stay with a person she met over the internet. She initially claimed that everything was alright and that she was then cavity searched after being detained in a dank, smelly room. Later when more facts arise from Barbadian papers, her story changes in the Observer to claim that initially everything really wasn’t alright as the person she was supposed to be staying with reportedly was ill and could not come to collect her at the airport and instead sent a male friend of hers to pick up Ms. Myrie. Ms Myrie of course did not know the man and admitted as much to the immigration officials. However the man in question is apparently suspected of being involved in woman trafficking/prostitution. After which she was apparently cavity searched and detained in a dark, smelly room before being deported. As Ms Myrie has again had to change aspects of her story (this time in court) she is going to have a serious problem with credibility. Her case is certainly NOT being helped by fact that one witness for the defence/Myrie’s/GOJ’s position was found to be illiterate and couldn’t understand the question being posed and another witness took the stand to outline a similar claim of discrimination only for it to be revealed that he didn’t have enough funds to stay at the place he claimed he had booked for the length of time he had claimed to book it for and that the event he claimed to be going to Barbados for would have been held outside the length of stay of his visit. Hopefully the judges will not let such circus antics prevent them from determining the truth and judging accordingly. And it is my belief that Ms. Myrie was either the unwitting near-victim of a potential woman trafficking ring or was complicit in said ring. Because after all she had never actually MET the person she claimed to be staying with and the person in question claims not to know her. It’s not beyond the realm of possibility that the man who came to meet her (or maybe abduct her) at the airport had been conversing with her over the internet under the identity of this woman (Ms. Pamella Clarke). Or Ms. Clarke might be working with him in this ring. Or it might be a woman who has information concerning Ms. Clarke’s identity. And perhaps Ms. Myrie knew that she was going to end up working with this alleged prostitution ring. Or maybe she genuinely did not know and assumed the person she talked to over the internet was genuine. Whatever the actual case her answers and the circumstances would have been bound to make ANY semi-decent immigration authority suspicious. Certainly there is no way she would have been let into the United States by saying she was going to meet and stay with someone she met over the internet and that said person was ill and couldn’t pick her up and that instead a suspicious male friend is there instead whom she does not know. She would have been put on the first available flight back to Kingston. However it is unlikely that she would have been cavity searched. And at Grantley Adams International Airport she should not have been cavity searched if they were intending to deport her on the grounds that she might be caught up in something suspicious and because her answers did not satisfy the immigration officers. Now WAS she cavity searched twice? Possibly. I don’t know as I was not there. And if she was then the officers in question have to answer for that. But she is NOT helping her case by having to correct mistakes in her story and having clowns for witnesses. Her claim now that the officers in question were not wearing badges is supposedly going to be put to the test because there is supposed to be CCTV footage. Needless to say if the CCTV has clear images of the accused wearing a badge at the time of the interview when she claimed they were not wearing a badge then her case would be sinking fast. Her best bet might actually have been to start out by confirming that she now realizes her answers really did not and could not have satisfied any competent immigration officer but that she was cavity searched and such searches were not justified or properly authorized. What might happen is that the CCJ might declare that the Barbados immigration authorities were within their rights to deport her on the grounds that her answers were not satisfactory (and that while the Revised Treaty gives a right to freedom of movement for skilled workers and hassle free travel for all nationals this does not mean that immigration authorities are to give carte blanche approval in cases which appear suspicious) and that the circumstances of her arrival were clouded in suspicion but that she should have been subject to international standards of treatment in such a case and not been searched. She might be awarded damages and an apology for the searches (if it can be proven or shown to have been very likely to have occurred). Really though, I find the level of ignorance and laissez-faire attitudes by many other Jamaicans to be astounding. I recently travelled to another Caricom country with a few friends and one of them couldn’t give the immigration officer the full details of where/who we were staying with. Needless to say the officer told him to come out of the line and wait until he could provide the full details and thereafter grilled him a bit more. And this friend of mine has travelled on numerous occasions and is no fool. So I don’t know why he seemed to assume that you could simply go up to any immigration officer and provide incomplete details and have them waive you through. It seems we think that the level of scrutiny leveled at passengers (including Jamaicans) by US, Jamaican, British and Canadian immigration authorities should not be leveled at us when we go anywhere else in Caricom. For what reason I do not know, because Caricom is not a unified domestic space as occurred in 2007 for the World Cup and occurs in Europe. We kind of blew that chance in 1961 when we voted against Federation in that referendum. We cannot and should not expect to land in Barbados, Antigua or Trinidad and just breeze through as if we had landed in Montego Bay or Negril on a flight from Kingston. If that is what we want then we need to be serious and let the other territories know that we want FULL freedom of movement in a single domestic space and want full political union (and that this time we won’t botch it up by wanting to have our cake and eat it too when it comes to federal politics). Article describing George Zimmerman in court – It’s said that clothes make the man, and when the man in question is charged with second-degree murder, clothes may make all the difference. When George Zimmerman recently appeared in court for a hearing that allowed him to bail out of jail, he was wearing a crisp bluish-black business suit which accented his arched Mesoamerican features and his small, stubby fingers. You should probably rethink your comments about EC’s description of SM since it is something that;s done across the board. Sorry my friend, not so quickly, the article you quote didn’t open with a description of Zimmerman’s clothes with no mention before or after of why this was important. The context was laid for why clothing was important, which is what i was asking for…in its absence just to describe in such detail what the claimant is wearing is baffling. Go and read Emily’s post before trying to have this discussion. At no point is the laborious attention to clothing explained or contextualized. That’s unacceptable. It looks to me as if we have nationality, class, and gender all at play here. If we are concerned about descriptions and the attending stereotyping why call Barbados prim and proper… Is the description irrelevant or is it aimed at ensuring that your readers underline the point which you are trying to make before the court that Barbados has a bias against her, the entire population of Barbados, perhaps? Myrie said later she was disappointed with Barbados and she ‘looked down’ on the zinc roof houses etc… is that a class bias? Should people in the region continue to cuss out each other and say negative things about our countries and their people? Are Barbadians taking on bits of Trinidadian culture and Jamaican culture? Are they? Prim and Proper what are we trying to continue here… is it unity? is it regionalism? What is it? a large percentage of Jamaica acts prim and proper too, especially when dealing with the hoi polloi, so don’t feel no way as they say here…but isn’t it true that Barbados prides itself on being a cut above the rest in terms of law and order, civility, education and so on? Yes, Barbados prides itself for its advancement in human resource development, health facilities and so on. I am unaware of the law and order thing (we always mourning about growing lawlessness, crime and violence) but if the human development index says we are doing well using their indicators, should we hang our heads in shame? My Jamaican friends, speak glowingly of their country’s achievements in sports, entertainment, their food etc; they are happy because people from around the world want adopt aspects of their culture; they gloat about the drive of heir businessmen and companies that are making large international strides. It all means that we in the region have things to be proud of… Bajans, especially, young ones, take on aspects of your culture… my question is why speak as if Barbados is the region’s whipping boy, is it a size thing (geographically-wise and lack of natural resources wise…)? Thanks for this much needed perspective on Barbados. Perhaps people resent Barbados because its done well for itself in comparison with the rest of the Anglophone Caribbean. There’s also a sense that Badians are arrogant but then Jamaicans have that rep too! And you are very welcome for the comments Annie. 🙂 I enjoy informed discussion. It does not surprise me anymore though that these views persist. It’s rather embarrassing though how little people seem to think before spouting off nonsense. Like the grumbling I heard from some passengers on the same flight that they were being subject to searches of their luggage simply because they were Jamaican. Of course, given that the flight originated from Jamaica and was a direct flight, it was only logical that Jamaicans would be on the flight. And that it would be unavoidable that customs would search the luggage of some people (I would be surprised if there was any flight in which customs officials didn’t at least randomly subject one bag to a bit more searching than others) and that some of these people would be Jamaicans. I was tempted to ask them if they think they should be immune from having their bags searched at all just because they were Jamaican but decided they simply wouldn’t understand. The fact that on arrival back in Jamaica we had our bags sniffed out by sniffer dogs and customs prevented us from touching the bags until the dogs were finished elicited no grumblings even though when I asked the customs officials said it was policy to sniff bags, especially on flights between the islands and between Jamaica and the States to look for drugs. Nobody though seemed to take offence or believe that the customs official was essentially implying all islanders (including Jamaicans) were drug mules. No doubt though that had this occurred in Trinidad or Barbados there would have been grumblings about discrimination. I’ve also experience nonsense being loudly proclaimed despite complete ignorance on the part of the persons saying it. Like persons claiming “Bajans don’t like wi” despite those persons having never been to Barbados and quite possibly never having ever interacted with a Barbadian in their life. Of course it doesn’t surprise me when people like that DO end up with bad experiences when they travel….because they were looking for bad experiences and everything that happens to them is coloured by this outlook. When you go expecting/looking for trouble you will often find it. So they get randomly searched and think it MUST be because of their nationality. Or they do end up getting into a bad experience with immigrations – but for that I strongly suspect that at least some of them come with an attitude and this attitude is clear in their body language and facial expressions; which only primes the immigration officer to do exactly what the person expects the officer to do – hassle him/her. Perhaps my experience with dogs since I was little has taught me the importance of body language, expressions and giving off signals since if you are afraid of a dog then the dog WILL know it. Dogs are mammals and people are mammals. I have little doubt that people do read these signals even subconsciously and react accordingly. Hopefully this trial will end with a sound judgement and true justice and no damage/fallout. It might even be nice if a judgement that both sides could claim victory from allowed for an easier passage of the CCJ legislation in Jamaica. Next Next post: Doubletake: First Mattathias Schwartz, Now Dan Rather. What ails Jamaican media?